Following a lengthy consultation and design development process, our proposal for a new stained glass window, for the Chapel of St. Mary’s RC School, Leyland, gets the green light. 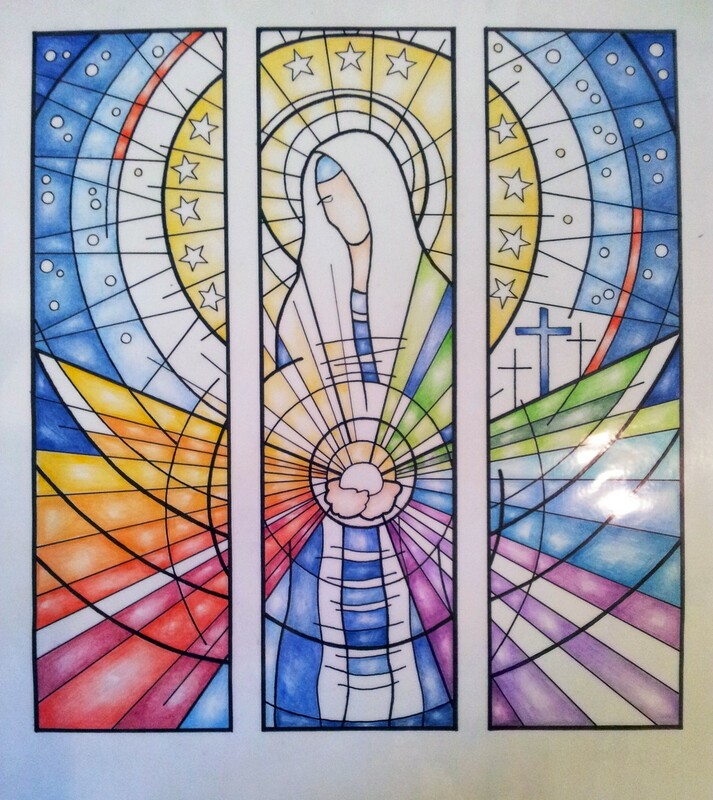 Having been contacted by St. Mary’s towards the end of 2013, Lightworks were tasked with designing a new stained glass window to be situated within the current Chapel room of the school. Following a number of meetings with the Chaplain, Anthony Cave and members of staff, we produced a series of very rough design draft proposals based on the central visual theme of “Our Lady – Queen of Heaven”, and the school’s motto: “Let Your Light Shine”. One of these drafts was then selected and developed into this final design concept. In meeting our clients brief, the design is contemporary in style and makes use of strong simple lines to produce the principle visual elements. Rather than taking the obvious approach of including the school motto in written form (itself causing problems in terms of not being able to read lettering on both sides of the glass; the outer face being viewed in reverse), we chose to represent this with the sweeping arc of colours of the spectrum emanating from the hands of Our Lady. Being somewhat visually ambiguous, this element of the design serves to not only directly represent the school’s motto, but also to reference the acceptance of the light of the Holy Spirit. As such, meeting a final and key brief requirement; to invite the viewer to seek out additional meaning within the design. Production of the glass is due to begin in early September and we will continue to post updates throughout production of the commission.